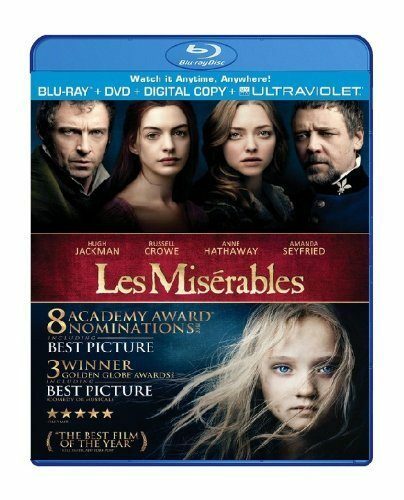 Les Misérables DVD $4.99 or Blu-Ray $6.99! You are here: Home / Great Deals / Amazon Deals / Les Misérables DVD $4.99 or Blu-Ray $6.99! Head over to Amazon and get Les Misérables on Blu-ray for only $6.99 (reg. $22.98). Or, you can pick it up on DVD for $4.99 (reg. $19.98). Hugh Jackman, Academy Award winner Russell Crowe and Anne Hathaway star in this critically-acclaimed adaptation of the epic musical phenomenon. Set against the backdrop of 19th-century France, Les Misérables tells the story of ex-prisoner Jean Valjean (Jackman), hunted for decades by the ruthless policeman Javert (Crowe), after he breaks parole. When Valjean agrees to care for factory worker Fantine’s (Hathaway) young daughter, Cosette, their lives change forever.